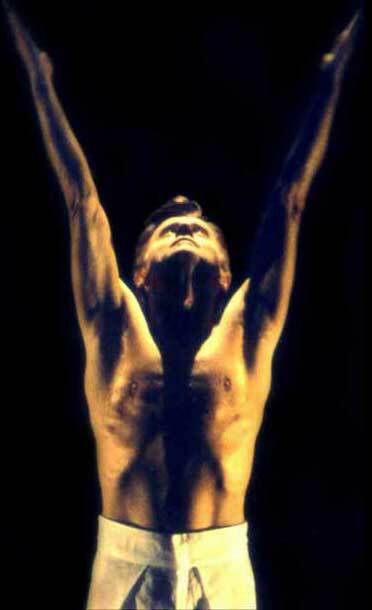 Richard Move was originally commissioned in 2002 to create The Show (Achilles Heels) for Mikhail Baryshnikov's White Oak Dance Project. Initial performances of The Show were acclaimed as “A brilliant work, and the most revolutionary piece Baryshnikov has commissioned” (The Star Ledger); "A powerful, iconoclastic theater piece made to measure for the 21st Century” (Dance Magazine); and “A work that extends the definition of postmodern” by (Domenica, Italy). Performing the virtuosic lead role originally performed by Baryshnikov, will be Rasta Thomas, an astonishing performer and one of the most acclaimed dancers of our time. The Show is being restaged and presented under the auspices of “Baryshnikov Dance Foundation (BDF) Presents”—a new program of BDF to help support and tour-manage the works of important artists. “BDF Presents” continues the mission begun with White Oak Dance Project - to bring the bold, innovative and contemporary work of choreographers and other artists with a distinctive voice to stages around the world. Richard Move is honored to be among the first artists to work with BDF in this way. The Show (Achilles Heels) will be presented in New York City and an international tour will follow. The Show (Achilles Heels) features a wholly original score by Arto Lindsay, one of the leaders of the New and World Music movements for the past several decades. Pop icon Deborah Harry of Blondie fame, has contributed original songs which she she will be performing live in New York and other select cities, in the role of the Goddess Athena. Renowned painter Nicole Eisenman, whose work has been seen worldwide, acclaimed lighting designer Les Dickert and Obie Award winning costume designer Pilar Limosner, complete the creative team. A highly theatrical rendering of the Greek legend of Achilles, The Show (Achilles Heels) is a present day staging of the timeless “Hero’s Adventure,” with its themes of war, violence, fame, honor, pride, injustice, mortality and immortality. The Show illustrates certain aspects of Achilles’ character most intriguing to Move—in particular, his loving loyalty, and the duality of the private life of this great warrior / hero. This story is set amidst the bizarre context of the essentially innocent Helen—a pawn whose only crime was her extreme beauty and charisma. Choreographically, the work is an eclectic meld of dance forms—from classical modern techniques to post modern principles, to hip hop forms and other contemporary cultural references. Most of the original cast of eight ethnically diverse dancers and former members of White Oak Dance Project, will reprise their roles.